Hey there FEU. I’ve got some some ideas here that I was hoping you could help me iron out. Let me start by saying that I’ve never done anything like this before, so if my work seems really rough, that’s why. 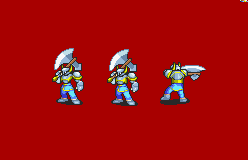 Most important one first: I noticed someone in the Graphics Repository pointed out how it’s strange that we don’t have a sword using Wyvern Rider, so I threw something together to use as a base. Which one do you think looks the best, or should I go for a different sword? And do you think it should be a slashing or stabbing animation? I’ve always been a fan of the DS Berserkers design, since I like the armored look a lot more. With Der releasing his Berserker, and it being everything I’ve ever wanted for an animation (especially the overhead crit), I decided to play around with making something like that with it. I’m just wondering how far I should go with the armor: keep it how it is right now, do the legs as well like the DS design, or just armor the whole thing? I’m also concerned about keeping the Berserkers big body accurate, since as you can probably tell from the far left one, he looks kind of weird when you just slap a Generals armor on him and do some cleanup. 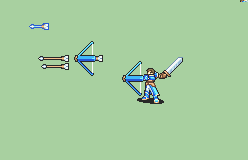 With the Pushwall Lance Hero existing, the only physical weapons Heroes don’t have an animation for is the bow. This is just a very rough idea where instead of having the shield act as a quiver, what if you had it be both that and the bow? Not sure if you’d want it to function like a regular bow or a crossbow. Might be wisest to have it function as a quiver while using a normal bow and doing the acrobatics Heroes are known for though. Thanks to anyone who looks through this, and I hope these are at least a little interesting for you. EDIT: Not sure if I should have stated this when I made the thread, since these are pretty much just copy+pastes, but if anyone wants to do anything with the sprites or ideas here, they are more than welcome to do so. 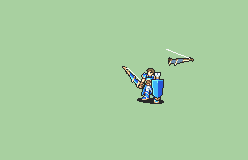 Now updated with a new sword wyvern variant and a better bow hero. I like the thicker sword of the wyvern rider more. I think it should also should not share colors with the wings, you can have all types of different color weapons. The armour looks fine to me as is. If u want to add more amour feel free to. Im not exactly sure how I’m suppose to look at the hero with the bow. For one, the bow isnt suppose to be at that angle. If it was a crossbow it could make more sense. There could be a quiver where u hold the bottom of the gun. The shield bow Hero would be it getting into position, or something like that. I’ve realized that it’s not really a good idea though, so I’m going to scrap it. The sword Wyvern Rider does look better with the thicker blade, but it kind of clashes with the Wyvern Lords sword, since that one is less impressive looking comparatively. Then again, I’ve always felt vanilla WL swords look too weak, so maybe that’s unavoidable.